College soccer teams play a variety of conference and non-conference games throughout the fall season, with the season culminating in the post-season tournament called the College Cup. The St. Louis University Billikens is the most successful men's team, having won 10 College Cups while the North Carolina Tar Heels led by head coach Anson Dorrance is the most successful women's college soccer team with 21 College Cup wins. The best men's and women's college soccer player each year is awarded the Hermann Trophy. After their collegiate careers, top men's players often go on to play professionally in Major League Soccer or other professional leagues while top women's players may play professionally in the National Women's Soccer League or in other professional soccer leagues around the world including Division 1 Féminine in France, Damallsvenskan in Sweden, Germany's Frauen Bundesliga, Australia's W-League, or Japan's Nadeshiko League. 4 History of college soccer in the U.S.
After many months of extended unofficial discussion, on August 22, 2016, NCAA Division I men's coaches and the National Soccer Coaches Association of America (NSCAA) officially began an "informational campaign" to build support for a proposed change of the playing schedule for Division I men's soccer. Under the proposed changes of the "Academic Year Season Model", the number of games on the Fall schedule and the number of mid-week games would be reduced, with games added in the Spring following a Winter break, and the NCAA Division I Men's Soccer Championship tournament would be moved from November and December to May and June. In addition to more closely matching the professional season, the changes address issues of player health and safety and of the time demands on student-athletes. The proposal concerns only Division I men's soccer. While a large majority of men's coaches and players support the changes, only a small minority of women's coaches and players currently do so. At this time, there is only the "informational campaign" "...to educate our Athletic Directors, NCAA leadership, student athletes, coaches and fans on the advantages of this Academic Year Model," said Sasho Cirovski, NSCAA D1 Men's committee chair and University of Maryland head coach. No formal proposal has been made to the NCAA. While similar in general appearance, NCAA rules diverge significantly from FIFA Laws of the Game. A manager may make limited substitutions, and each player is allowed one re-entry which must occur in the second half of the match unless the substitution was caused by a player injury resulting from a caution or send-off. All matches have an overtime period if the game remains tied after 90 minutes. As opposed to a regular two-half extra time period, golden goal is applied. If neither team scores in the two ten-minute periods, the match ends in a draw (unless it is a playoff match, then it would go to a penalty shootout). College soccer is played with a clock that can be stopped when signaled to by the referee for injuries, the issuing of cards, or when the referee believes a team is wasting time. The clock is also stopped after goals until play is restarted, and the clock generally counts down from 45:00 to 0:00 in each half. In most professional soccer leagues, there is an up-counting clock with the referee adding stoppage time to the end of each 45-minute half. In February 2017, the NCAA rules committee met to discuss a proposed rule that would change the double jeopardy rule. If the last player was to foul a player and deny a goal scoring opportunity, this goal would instead give the referee the ability to choose to issue a yellow card, if they were to feel it was a proper attempt to get the ball. The change was approved. Stadium clocks would count upward, and the displayed time would be based on the elapsed time of the game. The official time would be kept on-field by the referee. When the stadium clock indicated one minute remaining in a half or overtime period, the referee would signal the amount of stoppage time to the sideline, and a sign indicating the number of minutes of stoppage time would be displayed. The committee felt that the then-current timekeeping system led to gamesmanship, specifically blatant delaying tactics, at the end of matches. However, an NCAA oversight committee tabled the proposal, meaning that the current system (official time kept on the sidelines by a downward-counting or upward-counting clock) will remain in place. History of college soccer in the U.S. The first de facto college football game held in the U.S. in 1869 between Rutgers University and Princeton was contested, at Rutgers captain John W. Leggett's request, with rules mixing soccer and rugby and loosely based on those of the Football Association in London, England. However most sports historians argue that this was actually the first-ever college gridiron football season in history. But that perception is changing, with Harvard being recognized as a pioneer in gridiron football, along with McGill, Tufts, and Yale. The NCAA first began holding a men's national soccer championship in 1959. Prior to 1959, the men's national champion had been determined by a national poll instead of through a national tournament. St. Louis University won the 1959 inaugural championship using mostly local players, defeating a number of teams that were mostly foreign players. St. Louis University continued to dominate the Division I Championship for a number of years, appearing in five consecutive finals from 1959 to 1963 and winning four; and appearing in six consecutive finals from 1969 to 1974 and winning four. College soccer continued growing throughout the 1970s, with the NCAA adding a men's Division III in 1974 to accommodate the growing number of schools. 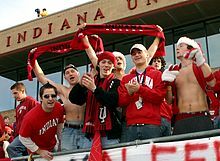 Indiana University's men's soccer program achieved success in the 1980s, 1990s, and 2000s with 8 national championships, 6 Hermann Trophy winners (national player of the year), and 13 national team players. From 1973 to 2003 no team won more men's national championships or had more NCAA College Cup appearances than Indiana. Virginia won a record four consecutive men's national championships from 1991 to 1994 under head coach Bruce Arena. The first college women's varsity soccer team was established at Castleton State College in Castleton VT in the mid 1960s. A major factor in the growth of women's college soccer was the passage of the Education Amendments of 1972, which included Title IX that mandated equal access and equal spending on athletic programs at college institutions. As a result, college varsity soccer programs for women were established. By 1981, there were about a 100 varsity programs established in NCAA women's soccer, and even more club teams. The AIAW (Association for Intercollegiate Athletics for Women), was established in the mid 1970s and began sponsoring women's varsity programs. It establishing an informal national championship in 1980, which Cortland State won. A year later in 1981, the tournament was hosted by the University of North Carolina, which ended up winning the tournament as well. In 1982, the NCAA began to sponsor women's sports and all schools switched into the NCAA. One major difference in the growth of women's college soccer unlike men's college soccer, was that it did not start out primarily in one region of the country and spread through the decades. With help from men's soccer, the women's program was able to take root all over the country at once, and grow from there. The University of North Carolina, coached by Anson Dorrance, immediately stood out as the ones to beat in the women's college game and remain that way up unto today. Of the first 20 NCAA championships, 16 were won by UNC, including nine in a row from 1986-1994. The following teams have won the College Cup two or more times. The following teams have won the College Cup. A number of American college soccer programs have developed players that have gone on to play professionally or for the U.S. national teams. Every year since its inception in 1996, Major League Soccer (MLS) has held a SuperDraft in which MLS teams draft young prospects. The draft picks in the MLS SuperDraft are often U.S.-based college soccer players. A similar format is held each year for the National Women's Soccer League (NWSL): the NWSL College Draft. The Hermann Trophy is awarded annually by the Missouri Athletic Club to the top male and female college soccer players in the United States.At the start of the college soccer season a list of Hermann Trophy nominees is compiled. Near the end of the college regular season, 15 players are announced as semifinalists. In early December the top three vote-getters for both the men's and women's trophy are announced as finalists. In an annual banquet held at the Missouri Athletic Club of St. Louis, the winners of the two awards are announced. Hermann Trophy winners who have starred for the U.S. national teams at multiple FIFA World Cups include Tony Meola (1989), Alexi Lalas (1991), and Claudio Reyna (1993), Michelle Akers (1988), Shannon Higgins (1989), Kristine Lilly (1991), Mia Hamm (1991–92), Tisha Venturini (1994), Shannon MacMillan (1995), Cindy Parlow (1997–98), Aly Wagner (2002), Kelley O'Hara (2009), Christen Press (2010), Crystal Dunn (2012) and Morgan Brian (2013–14). Many top American men's college soccer players play for separate teams in the Premier Development League (PDL) during the summer. One college club, the BYU Cougars men's team, has foregone playing in the NCAA or NAIA and instead play all of their games in the PDL. Several coaches who have won the College Cup have gone on to coach Division I professional soccer or even the U.S. national teams. The most well-known NCAA men's team coaches who have gone on to success in the professional ranks include Bruce Arena (four College Cups with Virginia from 1991 to 1994), and Sigi Schmid (won two College Cups with UCLA in 1985 and 1990). On the women's side, North Carolina coach Anson Dorrance coached the United States women's national soccer team during its early years from 1986–1994 and led the team to win the inaugural 1991 FIFA Women's World Cup in China. Former UCLA Bruins coach Jill Ellis led the national team to win its third World Cup at the 2015 FIFA Women's World Cup in Canada. Many women's college soccer players take opportunities to play professionally in the National Women's Soccer League (NWSL) and in Europe, Asia, and Australia. Players are also chosen from college to be a member of the United States women's national soccer team. The NWSL started in 2012 and now consists of 10 teams. This most recent draft in 2017 took place in Los Angeles, California with Rose Lavelle from Wisconsin going in the first round to the Boston Breakers. Recent winners of the Mac Hermann Trophy include international players such as Kadeisha Buchanan (2016), Raquel Rodríguez (2015), Morgan Brian (2014, 2013) and Crystal Dunn (2012). There are approximately 800 NCAA men's soccer programs—206 NCAA Division I, 207 Division II, and 408 Division III. There are 959 NCAA women's soccer teams—310 Division I, 225 Division II, and 424 Division III. The number of men's Division I programs has stayed roughly constant since the mid-1990s, but the number of women's Division I programs has increased from 190 in 1995–96 to 310 in 2008–09. In the United Kingdom, the BUCS Football League governs soccer in colleges and universities. In South Korea, the university soccer competition is called the U-League. Created in 2008, it is the first organized league competition for university soccer teams and operates outside of the regular Korean soccer league structure. ^ smeyers@ncaa.org (June 9, 2015). "DII Championships Committee addresses soccer field size". NCAA.org - The Official Site of the NCAA. Retrieved October 5, 2017. ^ "College soccer". Weebly. April 16, 2017. Retrieved April 16, 2017. ^ "NSCAA D1 College Men Propose Academic Year Season Model". National Soccer Coaches Association of America. August 22, 2016. Retrieved August 23, 2016. ^ "The case for extended college men's season". Soccer America. August 23, 2016. Retrieved August 23, 2016. ^ "NCAA SOCCER 2014 AND 2015 RULES AND INTERPRETATIONS". NCAA. ^ a b c "College soccer". Weebly. April 16, 2017. Retrieved April 16, 2017. ^ "College soccer: Double jeopardy rule in soccer adjusted". NCAA & Turner Sports Interactive, Inc. March 8, 2017. Retrieved August 12, 2017. ^ "Soccer referees could start keeping official time" (Press release). NCAA. March 29, 2018. Retrieved March 29, 2018. ^ "Harsher illegal participation penalties approved in college soccer" (Press release). NCAA. April 27, 2018. Retrieved April 30, 2018. ^ "Men's Soccer Attendance Records" (PDF). National Collegiate Athletic Association. 2017. Retrieved August 13, 2017. ^ "Women's Soccer Attendance Records" (PDF). National Collegiate Athletic Association. 2017. Retrieved August 13, 2017. ^ "ESPNFC: Soccer BYU far from a traditional college soccer program". Retrieved March 12, 2018. ^ "The Women's Soccer Dynasty of Anson Dorrance". U.S. Soccer. January 29, 2016. Retrieved April 17, 2017. ^ "Jill Ellis '88 and U.S. World Cup champions inspire another generation". William & Mary University. Retrieved April 17, 2017. ^ a b Soccer, College Sports Council. ^ "KFA". www.kfa.or.kr (in Korean). Retrieved March 12, 2018.